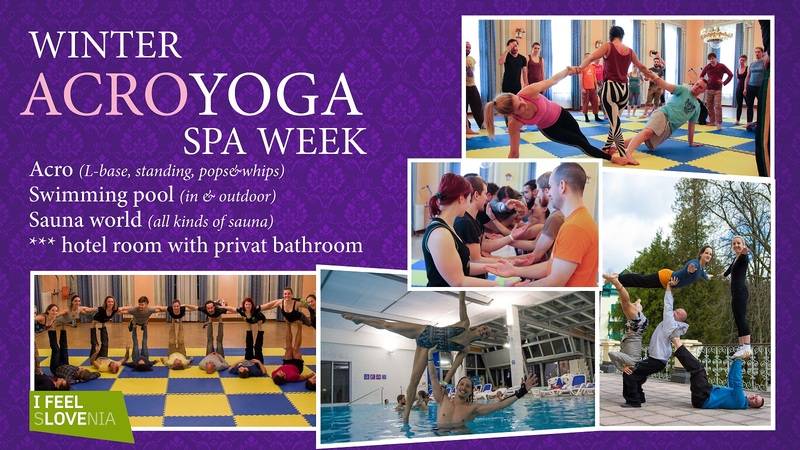 We proudly present our third whole week acro retreat. Theme of this retreat is again Tehnique before power! We will spend this week at the Terme Dobrna, where we offer a beautiful double bedrooms with privat bathroom in a 3 * hotel and a beautiful old weding hall for training. This week is dedicated to acroyoga & partner acrobatics, handstands, therapeutic flying, various massage techniques and meeting new people with pampering in the pool and saunas and whirpools. ++ Handstand expert with masters degree in Sport science Martin and yoga teacher and super flyer Vanille will represent Flying High Acrobatics. ++ Uwe & Kerstin are super cool teaching couple from Graz. They are experts at Icarian and conecting acro with theatre. ++ Zo Oé from AcrÔM LadieZ Machine duo, specialised in L.basing mindblowing washing machines and Thai massage and Wuo tai therapist. 3 star hotel breakfast and dinner, 4 star hotel lunch. We offer option with lunch or without lunch but with fruits and snacks and coffe. € 475 from 1st of February till start. 1/3 of which you pay when you apply and 2/3 you can pay at arrival. —-Registration is mandatory via this form https://goo.gl/forms/ARSihF5gVfQ2Lmut2 .